We’ve had such a diverse range of guest speakers, but one that stands out is a lecture from Totie Driver, a graduate of the course who came to speak about her design for Miss Saigon in the West End. “I most enjoy the diverse range of skills and practices we are taught – everything from costume to construction, masks, lighting and model making. 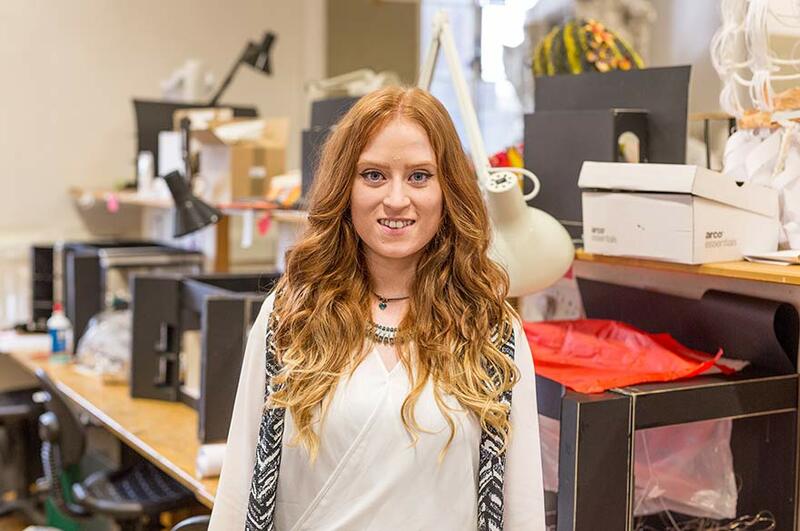 “Final year has given us all the opportunity to create a design for a realised project, and have it made. My project was Oedipus the King which was performed at Nottingham Lakeside Arts, working in collaboration with Nottingham New Theatre. It was a hugely valuable and enjoyable experience to work with outside professionals, and gain knowledge on how we can take our design ideas into a real-life setting. “We have staff that specialise in design / model making, costume design and making, essay and dissertation writing as well as puppetry and many other areas. The technical staff have such great skill and ensure they pass on their knowledge to us whenever we need help, or are unsure of how to achieve something. “We’ve had such a diverse range of guest speakers, but one that stands out is a lecture from Totie Driver, a graduate of the course who came to speak about her design for Miss Saigon in the West End. She showed us her process from photography through to model-making , and talked us through storyboarding, technical drawing and design process. We have since been fortunate to have Totie join the academic team, teaching us professional skills in AutoCAD, Photoshop and Sketchup. “Some if not most of us came to NTU enjoying drama and the arts but not wanting to be on the stage, wanting to study theatre design but not knowing exactly where it could take us. Throughout the three years the different skills and specialisations we have tried out have given us a much better idea of what the industry roles available to us are, and what it is that we want to specialise in and achieve. The support offered to us here is endless and invaluable. “I hope to become a freelance theatre designer, working either nationally or internationally with as many practitioners in the industry as possible, gaining new experience and knowledge.